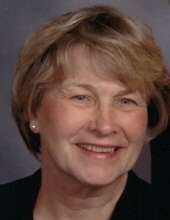 Margaret Ann Neilands, age 85, of Naperville, IL, passed away peacefully on January 15, 2019 at the Mike Conley Hospice House in Clermont, FL. She was born October 11, 1933 in Zanesville, OH. Margaret was married for 65 years to Thomas L. Neilands, who passed away on April 3, 2018. Surviving are her eight loving children Jeannine (Lenny) Wilson, Tom (Faith) Neilands, Rachelle (David Zath) Neilands, Pam (George Serterides) Neilands, Tracey (Gary) Gregory, Natalie Sandstedt, Tammy (Darrell) Alford, Andy Neilands; 11 grandchildren and 7 great-grandchildren. She attended St. Bernard’s High School, Corning, Ohio. She worked for 20 years at MetLife Insurance Company, retiring in 1999. She enjoyed golfing, playing bridge, and tennis. She enjoyed singing and sang in a church choir. All are invited to gather for the Mass of Christian Burial on Saturday, February 16 at 11:00 AM at SS. Peter & Paul Catholic Church, 36 N. Ellsworth St., Naperville. Interment will be immediately following at SS. Peter & Paul Cemetery. In lieu of flowers, the family requests that you make a donation to St. Jude Children’s Research Hospital at 501 St. Jude Place, Memphis, TN 38105 or online at www.stjude.org. To send flowers or a remembrance gift to the family of Margaret Ann Neilands, please visit our Tribute Store. "Email Address" would like to share the life celebration of Margaret Ann Neilands. Click on the "link" to go to share a favorite memory or leave a condolence message for the family.